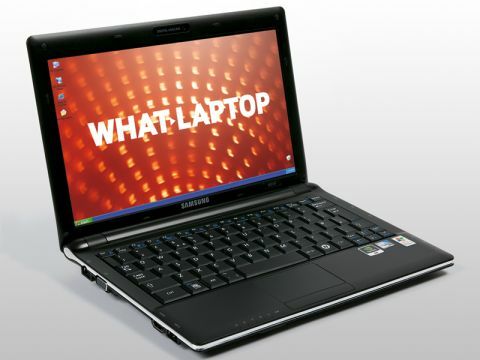 The Samsung N510 is the first Nvidia Ion-powered netbook to hit UK shores. Along with its great design and usability, the machine provides the kind of graphical power normally associated with much larger laptops. The 11.6-inch screen is excellent. Colour vibrancy and image detail are top-notch, helped by a sharp 1366 x 768-pixel resolution. There's also no Super-TFT coating, so no distracting reflections in bright light conditions. Build quality is excellent, with robust plastics used to good effect, ensuring durability on the road. The shiny lid quickly attracts fingerprints and grime, however. Samsung netbook keyboards are generally exceptional – a trend continued here – and it's one of the most comfortable keyboards we've used on a netbook. Nvidia's Ion technology is used and enables the machine to use a powerful Nvidia GeForce 9400M GPU to produce significantly more 3D power than the average netbook. This means you can run multimedia applications such as video editing suites and even basic games. Processing power remains firmly in the Intel Atom remit, however, so you won't be multi-tasking these applications, although running office programs concurrently won't be an issue. Portability is good, with the machine weighing 1.4kg. Despite the powerful components, the battery lasts an impressive 318 minutes. 802.11n Wi-Fi and 10/100 Ethernet provide the capability for wireless and wired networking. HDMI and VGA ports let you connect digital and analogue external monitors, and three USB ports provide plenty of space for peripherals. The Samsung N510 has set a new benchmark in netbook performance and, combined with its excellent build quality and usability, makes a truly compelling choice for those after a powerful and portable netbook.